Toilet brushes are rarely objects of great beauty but we all need them and so it’s refreshing to find a stylish example. This one is made by Redecker in Germany. Did you know that originally the bristles for toilet brushes used to be made from pig bristles, the hair of horses, oxen, squirrels and even badgers? This one, however, has black bristles made from high grade nylon. 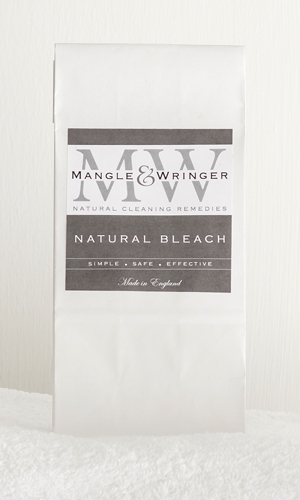 If you want to make your toilet bowl sparkle but don’t want to use nasty chemicals then you could try Mangle & Wringer’s Natural Bleach Powder. Simply add one scoop to 1 litre of hot water and pour down the toilet. Leave for 30-60 minutes or overnight and brush before flushing. It cleans thoroughly, kills germs and doesn’t leave that lingering chemical smell. Natural Bleach Powder has lots of other uses around the house too (please see the website http://www.plainuseful.com/product/mangle-wringer-natural-bleach. The packaging on the Natural Bleach is beautifully simple and so no need to hide it away.